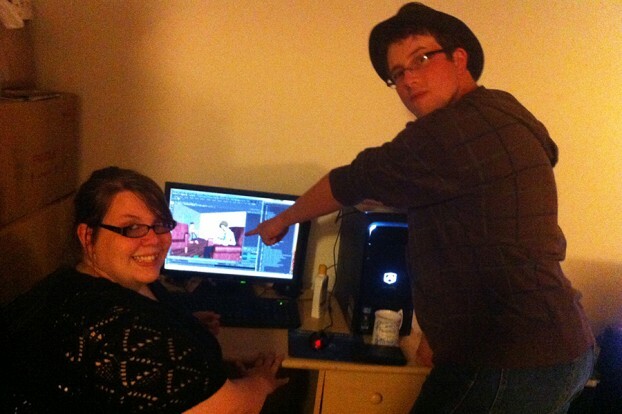 Loyalist animation students Karen Wood and Jean-Guy McLeod prepare for the TAAFI College Animation Challenge. Photo submitted by Karen Wood. Despite being the smallest team, two Loyalist College animation students matched up well against the other colleges at the Toronto Animation Art Festival on the weekend. Loyalist’s Karen Wood and Jean-Guy MacLeod competed in the festival’s first College animation challenge. Loyalist was one of nine college teams that have put together a 15-second clip to show to judges like David Silverman, the Director of the Simpsons. Wood said she was proud of her and MacLeod’s final project. “I was initially worried that our school’s piece wouldn’t be comparative to the other schools, but it was. It wasn’t the best piece there, but it wasn’t the worst either. So that’s an achievement for us, especially considering many people didn’t even know Loyalist had an animation program,” said Wood. The competition’s goal was to show the animation community what each school was capable of. Wood said it was a great night all around. “We received many compliments that night and made some great new connections in the industry,” she said. The teams had four weeks during the month of May to put together their clip and submit the final product by noon on May 31st. Wood said it was hard to find time to work on the project. “The biggest challenge for me was that I was working full time downtown Toronto, while trying to pull this off. It was very difficult for me to coordinate with my partner and to be able to figure out who is doing what,” said Wood. Wood’s partner, MacLeod, works full time in Winnipeg. The two did all of their work through social networks and Skype. “We coordinated a lot through Skype and Facebook and social media. He kind of worked on one thing and I worked on another. If I needed help with something I would ask him, then I would give him some things to do,” said Wood. The two were both busy with full time work, so Wood decided to take some time off to focus on their project. “He had a lot of time constraints, where as I had the opportunity to book those two weeks off, so I just went ahead and worked full time at it,” she said. After two weeks of editing, modeling and texturing, Wood and MacLeod got the project done by the deadline. Teams were given a picture of an apartment building. They had to choose a room in the picture and make an animation driven film inside it. The maximum time the film was 15 seconds. The theme for the clip is “caught in the act”. Wood is Loyalist’s representative for the Toronto Animation Art Festival. Once she heard about the competition, she thought it was a great opportunity for her college. She said it’s also a great opportunity for her and her partner to get noticed in the animation field. This was the first time Loyalist College had ever participated in a competition like this.